Nephrops norvegicus, kent as prawns, is a slim, orange-pink lapster that growes up tae 25 cm (10 in) lang, an is "the maist important commercial crustacean in Europe". 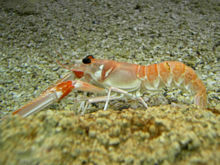 ↑ "Nephrops norvegicus". IUCN Reid Leet o Threatened Species. Version 2011.2. Internaitional Union for Conservation o Naitur. 2011. Retrieved January 1, 2012. ↑ Lipke B. Holthuis (1991). "Nephrops norvegicus". FAO Species Catalogue, Volume 13. Marine Lobsters of the World. FAO Fisheries Synopsis No. 125. Food and Agriculture Organization. ISBN 92-5-103027-8. ↑ Mike C. Bell; Frank Redant & Ian Tuck (2006). "Nephrops Species". In Bruce F. Phillips. Lobsters: Biology, Management, Aquaculture and Fisheries. Wiley-Blackwell. pp. 412–461. doi:10.1002/9780470995969.ch13. ISBN 978-1-4051-2657-1. This page wis last eeditit on 13 Februar 2018, at 06:50.